Authors - Andew L. Pruitt Ed.D. and Fred Matheny. Foreward by Chris Carmichael. Top professionals depend on Andy Pruitt to soothe their aches and pains and help them ride faster and smoother. Andy's advice can help you ride more comfortably and faster. It all starts with position. As the world's leading expert in scientific bike fit, Andy Pruitt will walk you through a complete fit session with clear instructions and teh logic behind each adjustment. 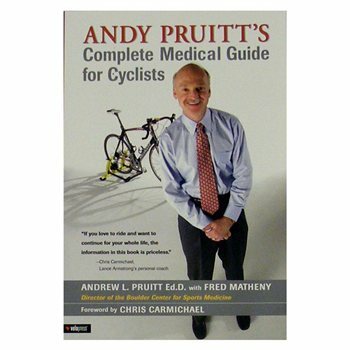 Should injuries happen, the book will help you pinpoint the symptoms, identify the cause and provides proven remedies to get you back on the bike. Includes tips on weight loss, stretching and rehabilitation.